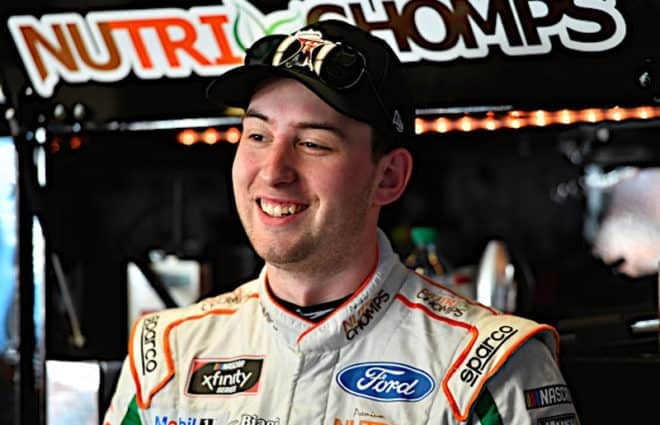 What can you say about an athlete who is consistently one of the most competitive drivers in NASCAR Nation? What can be deduced from the record of a racer who is a perpetual threat to win? What do you do about a former Cup champion who qualifies for the postseason like other mere mortals qualify for jury duty? What can one say about the 2016 racing season of Kevin Harvick? How about this: a lot…. Granted, Harvick failed to win the Daytona 500 last year, but would Denny Hamlin have squeaked his way past Martin Truex, Jr. for the victory if it were not for an assist from Harvick down the backstretch on the final lap? 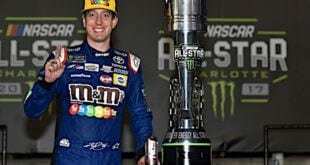 While helping Hamlin win “The Great American Race”, Kevin helped himself to a fourth-place finish. Top-ten finishes for Harvick and his No. 4 Stewart-Haas Racing Chevrolet were more of the rule than the exception at the start of the 2016 Cup season. Harvick scored top-tens in eight of the first nine events last season, strong performances which included a photo finish win over Carl Edwards at Phoenix in March. 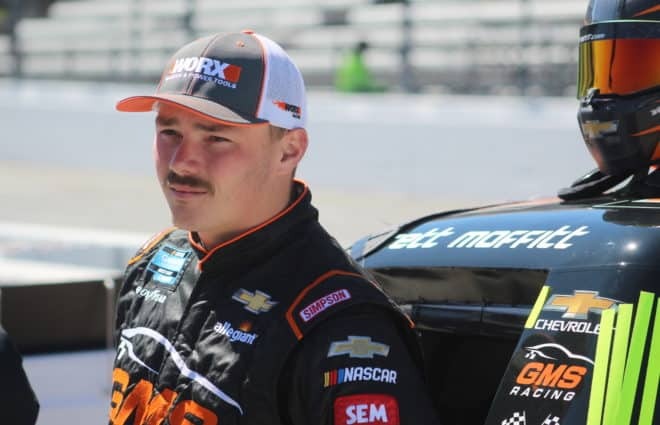 For all of the 2016 schedule in NASCAR’s premier series, Kevin notched 27 top-ten finishes. That’s a mind-blowing 75% on the year for all you number-crunchers out there…. Such consistency made “Happy” a certainty for the postseason. Such consistency in the postseason made Harvick one of the odds-on-favorites to win his second Cup title in three years. But such consistency didn’t come without its own set of consequences. 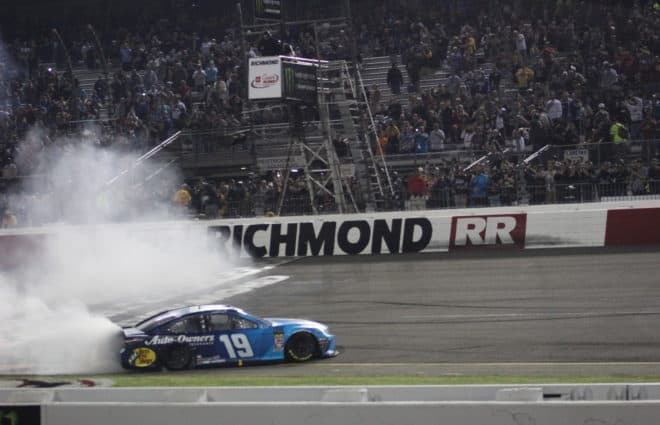 Strong race performances at tracks like Fontana, Kansas, and Charlotte were scuttled by poorly executed pit stops – flawed stops that robbed Harvick of important track position and quite likely additional victories. Not that the four wins Kevin and company enjoyed weren’t success enough for their SHR operation, but Harvick’s frustration over lackluster pit stops and missed on-track opportunities didn’t stay under wraps within the team. Kevin Harvick made much of his frustration known via in-car radio communications with his crew and through the comments he made over Twitter. 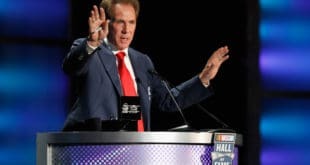 That said, Stewart-Haas Racing appeared to move toward a shared, more flexible crew structure where team members could be matched in a “platooning” kind of arrangement in order to custom-create the best performing squads of over-the-wall crew personnel. Such dedication to success marked not only the philosophy at Stewart-Haas, but the attitude that carried Harvick to his third straight postseason during the new elimination-round era. 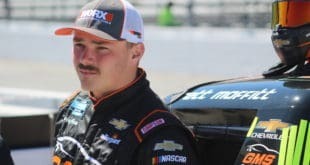 It’s been suggested that few drivers in NASCAR possess the same level of competitive fire as Harvick, and perhaps that statement was inspired by the California native’s outspoken nature regarding the efforts of both his team and himself. Consider that Harvick, while out of title contention, still raced hard to earn a third-place finish in the season finale at Homestead, and you get a sense of just how dedicated Kevin is as a driver. This dedication was apparent in Harvick’s social media interactions, as well. 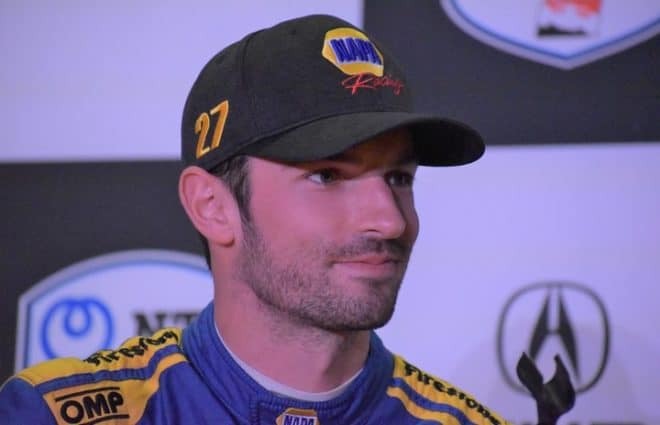 Apart from the aforementioned public criticism of his race day pit crew, Kevin used his online presence to communicate his state-of-mind as the opening race of the Chase approach in September. His now famous “charging bull” tweet set the state for how the postseason was going to unfold. Even after Harvick had been eliminated from title contention, this popular tweet was mentioned by those who used it as an example of Harvick’s competitive and tenacious nature. Not that all of Kevin’s social media presence in 2016 was so authoritative in tone. Thanks to the efforts of his wife DeLana, Harvick is recognized as a devoted father and family man, as well. A recent tweet shared how Harvick’s son Keelan helped his dad celebrate his 41st birthday. The photograph of a smiling Kevin being feted by his even more joyful little boy added a layer of “everyday” realism to the public image of the 2014 premier series’ champion. 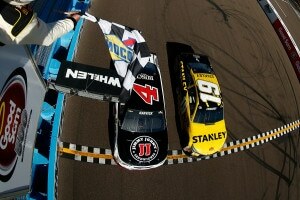 That said: Harvick’s slate of on-track rivals continued to step forward and challenge the driver’s patience. New threats like fence-riding Kyle Larson and steady-as-a-rock Chase Elliott provided Harvick with a glimpse into his competitive future, while old rivals like Jimmie Johnson, Edwards, Kurt Busch and Brad Keselowski reminded Kevin that his path to Victory Lane was anything but clear. Despite the challenges, Harvick managed to communicate some very clear messages regarding his 2016 Cup effort. Pushing Hamlin to victory in the Daytona 500 was just the start. 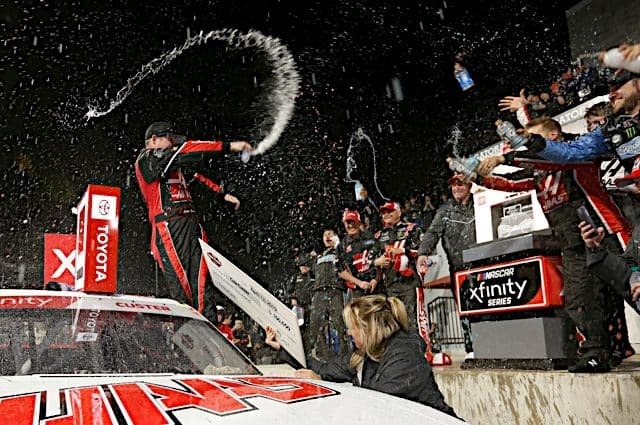 His at-the-line win against Edwards at Phoenix and his runner-up battle with Truex down the stretch in the Bojangles’ Southern 500 at Darlington (after leading 214 laps) were examples of just how dominant Harvick and his No. 4 Chevy could be. Even as Johnson pulled away to win his seventh premier series championship, an out-of-title-contention Harvick was still there on Johnson’s rear bumper to finish third. As we close the books of 2016 and the solid season enjoyed by Harvick, we now look ahead to the beginning of 2017 and a most momentous event: the switch of SHR from Chevrolets to Fords. 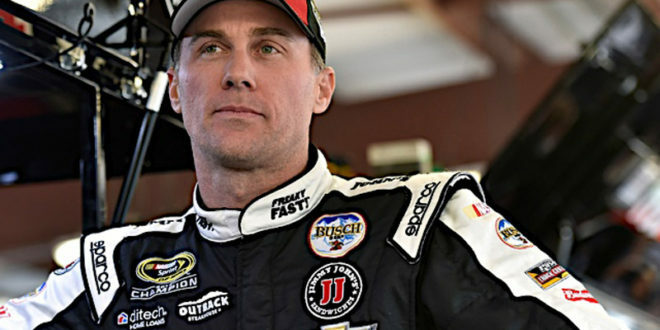 Will this change mean a change in the way Harvick drives, fights, competes, and wins? My guess is, based on what we saw during the 2016 campaign, the answer is a resounding “No”….